Over the past week, I found myself getting in my head. I knew that I decided to study abroad because I needed a change in my life. Back in Madison, I felt myself getting bored with who I was. I was anxious because I felt stagnant. I had fallen into a routine, one that I was not particularly fond of. During the past week and a half, I started to feel like I was falling into that same mood again. I found myself getting frustrated with miniscule things- things that I would usually brush off. I was constantly reminding myself to stay positive, and recognize everything I had to be thankful for. I knew that dwelling on the negative would never be (and has never been) progressive. But, in short, I was very frustrated. I just could not understand why I was feeling crabby. I was getting annoyed with myself for letting pessimistic emotions waltz into my life and challenge all of the magnificent things that I SHOULD have been feeling. Fast forwarding to this weekend, my roommate and I decided to head to Rome. We thought it would be good to get away, plus she had friends that could show us around while we were there. It’s safe to say that the slight ability I have in order to conjure up positive thoughts was summoned when we had a very rough time getting there (long story short, what should have been a 3 hour bus ride turned into a 8 hour train ride). Then, our plan for an outdoor touristy Saturday was completely canceled by the obnoxious rips of wind, which were strong enough to knock down a few trees (true story, I’m not just being dramatic). However, I was still clinging onto the facts: that I was in Rome, I had just met a new group of intriguing people, and we still had a whole other day there. So, by the time Sunday rolled around, I was really hoping that we were going to conquer it. Thankfully, my roommate was just as determined as I was to make the best out of our short weekend. We ended up seeing everything that we had hoped- The Trevi Fountain, The Coliseum, The Pantheon, The Vatican, The Sistine Chapel and my favorite part, The Forum. Here’s the thing, I tend to have a very lax approach to planning trips- as in I just go with the flow – as in, I am not a trip planner. So, when Gretchen told me that she wanted to see all of those places that I listed above, I was excited, but it just sounded like a lot of old Roman words. With that being said, I did not expect to be so captivated with The Forum. The Forum are Roman ruins, most of which fell apart during 420 AD. They could have been destroyed by fire or by simply falling due to erosion by water and rough weather. They originally started as buildings to a marketplace for the ancient citizens which later turned into several different government buildings (including the Forum built by Julius Caesar). 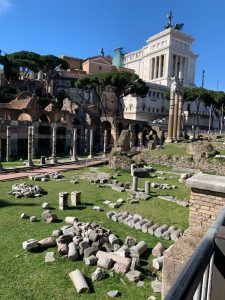 As I took it all in, I couldn’t help but be mesmerized by the thought of all of the old Roman’s simply walking around. It’s wild to imagine what was going through the minds of the people that lived during a completely different life time. Visions of the ancient Romans raced through my head, I thought about what they were trying to get accomplished, the differences in our day to day lives, the clothing they would wear, the worries they had (especially compared to mine), and the contrasting use of The Forum vs today’s use for it. It reminded me that everything we do has a purpose, whether we know it at the time or not. 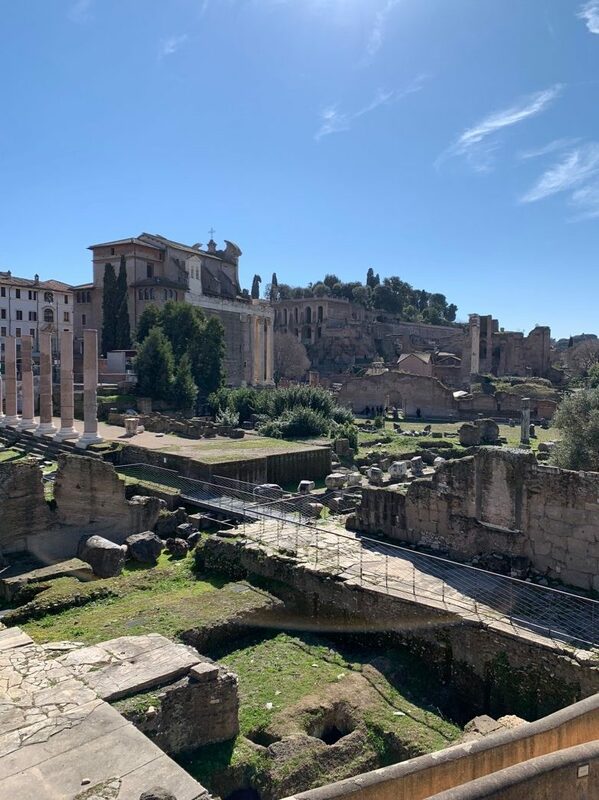 Every footstep ever taken in that Forum around 200 AD led to the creation of one of the most important relics and one of the most popular visitation sites in Italy. I reflected on this as I sat on the steps facing The Forum of Julius Caesar, a moment I will remember for a lifetime. I reminded myself that every step I take has a purpose and every attitude I experience will affect the decisions I make for my future. I also acknowledged the fact that bad moods happen sometimes, and it is only natural to eventually get frustrated with a routine, but it does not mean that all routines are bad. It also does not mean that all bad moods are bad- last week I was worried about my life going nowhere, so I applied to every random internship I could find (no one has responded to me yet, but it’s ok, the right one eventually will). I guess the point is this- everything that you do has a meaning behind it, and every miniscule task that you complete will change your life.